I think there’s nothing more peaceful than lambs. You rarely hear a peep out of them. Gosh, I have Peeps (the cute marshmallow kind) on the mind today. I really do have to stop eating those before my teeth rot right out of my head and I have to change my blogging profile picture. I did have that incident in high school where a cute little lambykins tried to smash me up against the wall in his stall and squished my toes. But I’m sure he was the black sheep of his family and was promptly disciplined. Or eaten. Either-or. I decided to pair my lambs up with my funeral basket. Go ahead, call it a wedding basket or even a florist basket, but we all know it’s a funeral basket. When I bought it back at the beginning of March, I asked my Facebook friends what color I should paint it and then I quickly cast aside their suggestions and decided to leave it as found. It just seemed an easier choice what with the weather being so cold and me not wanting to spray paint in the house. I’m sure it was bright white at some point, but it’s more like a dingy gray by now. BTW, the last time you saw this hall table it looked like a scene out of The Birds. So it’s out with the birds and in with the lambs for spring. Hope you enjoyed your first day of spring. I hear it’s going to be making an appearance in the Midwest in the next six months or so. Previous Post: « Speaking Of Dogs . . .
Now, I have never ever heard of a funeral basket, and I am not sure if I should ask?…I think it looks marvelous, but you always make everything look marvelous.. I actually have heard of a funeral basket. It might have something to do with growing up with parents who owned a funeral home. Another fabulous vignette. Those lambs are so darn precious. Seriously. Where is spring? We got 7 new inches of snow yesterday and it’s still coming down!! LOVE the lambs. Had to chuckle about spring making an appearance here in the Midwest in the next 6 months or so. You think? Saw snow flurries today. It’s 28 degrees. I adore all things lamb and birds…so naturally I love this post. So pretty and I really like your basket! 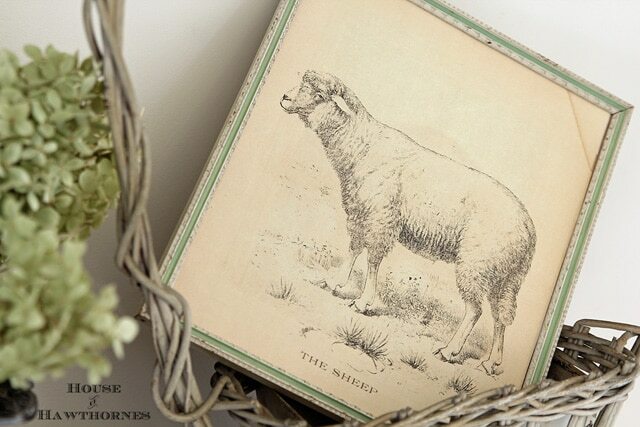 Oh the lambs are so sweet…do you know that Mary from Mary’s Meanderings collects lambs…?? I always think about that when I see them. Lambs are hard to find I think! The lambs are very cute. Are they vintage or just vintage look? I used to be a spinner and bought fleece from several flocks around. My favorite black sheep disappeared from my friend’s flock and I asked about him. It kept jumping the fence. The last time she got him back she put him in the freezer. Lambs are so sweet. Little lambie-pies. When I think of them, I think of gentle creatures. The epitome of innocence. 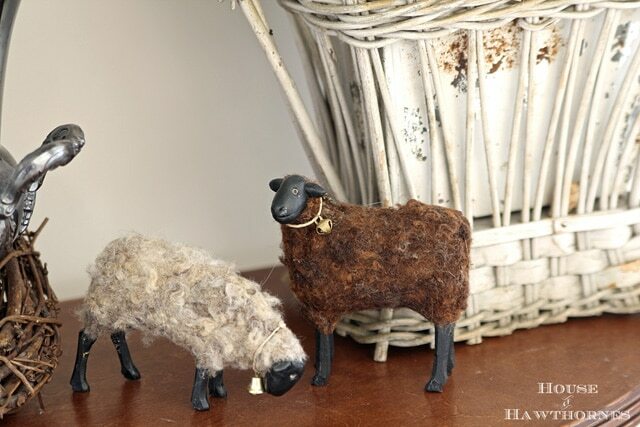 I am lovin’ me some lambs right now…so spring-y and Easter-y…loved seeing your post. Thanks for sharing those great photos. I’m glad that you left the funeral basket “as is”. I saw your post over at STone Gable blog. Will you be serving lamb for Easter dinner? Lovely lambs and a very nice vignette! I had my first Peeps yesterday, it wasn’t half bad!! I bought a pack for display with some Easter grass, they’re pretty cute! 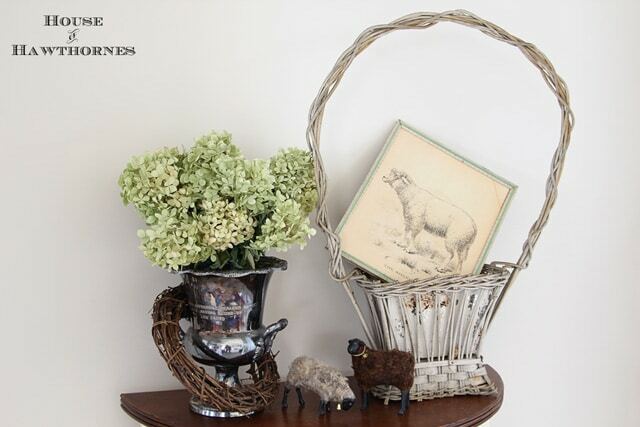 Love the lamb vignette and the funeral basket. Your sheep picture and lambs are sooo cute. I LOVE sheep, especially for Easter and Spring. Yep, that’s a funeral basket and I don’t blame you for leaving it in it’s “found” state/color. It’s perfect. I love your lambs. We have sheep and the lambs are adorable. Beautiful vignette. I think your little sheep are adorable. 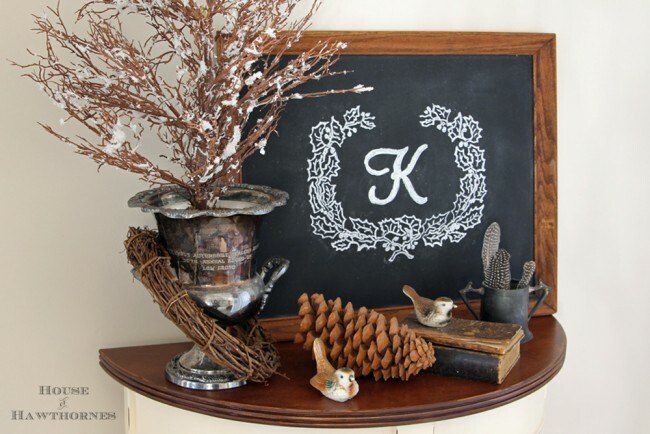 Love your vignette. The basket looks perfect as is. When I was little, I had a poodle skirt. I didn’t know it was a poodle skirt. I thought they were lambs. I thought lambs were cute way back then and I still do now. You always come up with such clever titles for your posts! Are lambs so cute?! I pinned the cutest little one awhile back…it looks like a stuffed animal…I just couldn’t get over it. I love this pairing of a funeral basket with this title. Clever. Hi Pam! Angela from twelveoaksmanor just stopping by to say hi! Thanks for stopping by today! Love your blog!!! I had to click on your link at Jennifer Rizzo’s party when I saw the lamb picture! I just purchased a piece of lamb artwork for the kitchen. Love your little lambie-kins! Lambs are one of my favorite things. One sits atop my sisters grave stone. 😉 Love the vintage ones, and the old drawings and artwork. We love lambs here…but your title sends chills up my spine 😉 Looks great!! Love your lambs, specially the one in the frame. The funeral basket is great as is. Spring? Is that a new season? Enjoy our next round of snow. Love the lambs – I collect sheep and would take that print from you in a sec. About the basket. I collect the wicker and the metal ones. When my mother graduated from high school (for girls only) in the 1940’s, each girl had a basket like this filled with flowers. The baskets lined the stage. I had to turn my heat back on – NO FAIR! 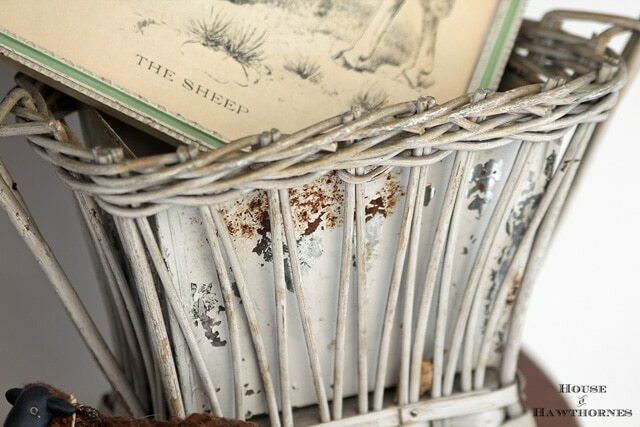 Love the lambs, AND the funeral basket! New follower!! Come over and visit! ya got me…love your lambies!! !